Trash photo in Manila Bay. Photo via Wikimedia Commons. Environment chiefs plan to restore Manila Bay to a “pristine state”, following the same strategy used to clean up the island of Boracay. Department of Environment and Natural Resources (DENR) Secretary Roy Cimatu said today (Sunday, December 16) that he wanted the polluted bay to be a place where people could again swim safely. “We are preparing for an all-out strategy to bring the coliform concentration in Manila Bay to a safe level so that millions of people who reside in the bay region and neighbouring areas will enjoy its waters and marine resources without fear of getting sick,” he said. He added that the government would “show the same level of political will” in cleaning up Manila Bay as it did during the rehabilitation of Boracay. The world-famous tourist hotspot was closed to visitors for six months after President Duterte described it as a “cesspool”. It reopened on schedule on October 26. 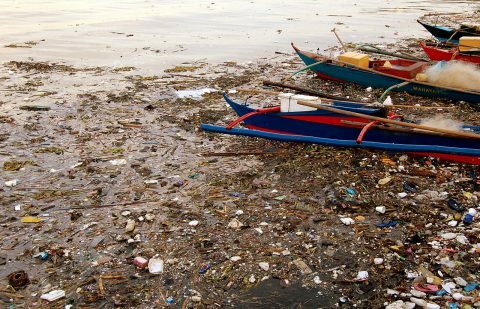 While still renowned for its beautiful sunsets, Manila Bay is notorious for floating patches of garbage and foul waters polluted by toxic waste. DENR Calabarzon Executive Director Ipat Luna said 90 per cent of the pollution in Manila Bay came from domestic waste. Calabarzon a major contributor, as its waste pours directly into Laguna Lake, and then finds its way to Manila Bay. “We are asking the LGUs [local government units] to help us enforce against those staying in the easements, because if we’re able to prevent them from throwing their trash – even if we patrol the areas every day, we’ll still be spending less versus finding new homes for them…. It’ll be much more expensive to relocate them,” said Luna. Cimatu also reminded LGUs to comply with environmental laws to help rehabilitate Manila Bay. “I am calling on all LGUs to step up their efforts in cleaning up the bay because it is their own constituents who will benefit,” the DENR chief said.